Barns-Graham had always worked with themes such as rock forms, line motifs and abstract reliefs which she returned to over the years. The glacier theme began in 19488 when Barns-Graham visited Grindelwald in the Bernese Oberland in Switzerland; she worked on the theme for three years whilst also making purely abstract works. 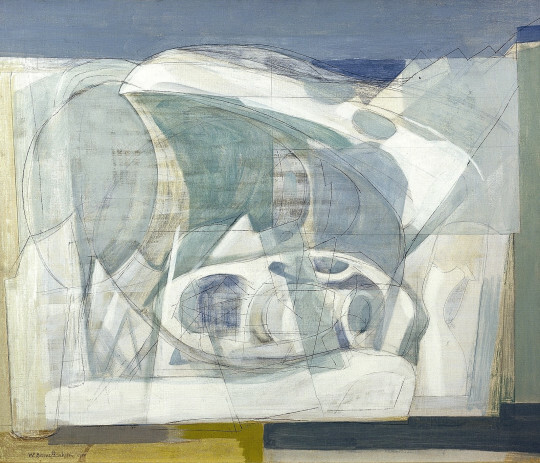 A similar painting to this, entitled Glacier Crystal, Grindelwald (1950) belongs to the Tate collection (www.tate.org.uk). The artist recalled ‘The massive strength and size of the glaciers, the fantastic shapes, the contrast of solidity and transparency, the many reflected colour in strong light … This likeness to glass and transparency, combined with solid rough ridges made me wish to combine in a work all angles at once, from above, through and all around, as a bird flies, a total experience’.